The last week of April 2010 marked the death knell of the 3.5-inch floppy disk, one of the mainstays of portable data storage since the early days of the personal computer in the early 1980s. Advances in ever-smaller, more portable, and vastly capacious data storage devices, such as recordable CDs and DVDs, and solid state devices such as USB flash drives and flash memory cards, hastened the end of the floppy disk that can store just a tiny percentage of data compared to the devices in use today. How far, then, has technology come regarding data storage devices? Let’s example a relic from the 1950s. The entire unit took up the space of two refrigerators and weighed one ton(!). Available only for lease, clients spent $3,200 per month for the full setup. The cost, as you can imagine, does not include the monthly electrical bill augmented by its use as well as the use of air conditioning to prevent it from overheating during operation. When you hear five million characters, does that sound like very much to you? It shouldn’t; that is equal to 4.4 megabytes (MB), or about four 3.5-inch floppy disks at 1.44 MB apiece. 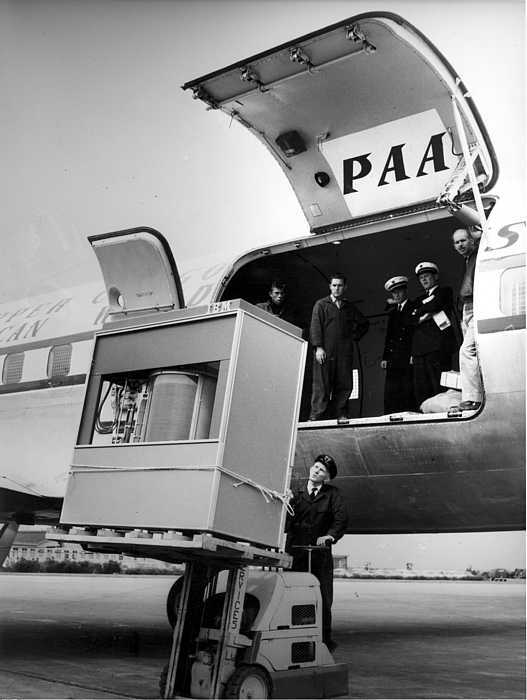 So over 20 years after IBM introduced the enormous hard drive, the physical storage of 4.4 MB went from two refrigerators to the mere thickness of about two or three Post-it® pads and weighing well under one pound. Go forward another 30 years to the present time and ubiquitous, very lightweight, ultra-high capacity storage devices has marked the end of the 3.5-inch floppy disks. However, if you wanted to have a floppy disk backup of your one gigabyte USB flash drive, how many disks would that take? Brace yourself: you would need about 700 floppy disks(! ), weighing just over 30 pounds, a huge burden on your neck considering that a USB flash drive weighs 2.1 ounces. How much smaller will data storage devices become in the future? 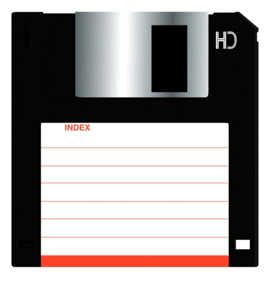 The 3.5-inch floppy disk, once the new benchmark in light storage devices, seems quite “heavy” in the face of much lighter solid state data storage devices available today. Its end was only a matter of time. Just before the economic decline that began in the last quarter of 2007, the average personal savings as a percentage of disposable personal income for households in the United States hovered just below 1%. Over two years later, despite high unemployment, the percentage remains seemingly unchanged. Credit card debt. Recession. Real estate meltdown. What relief do we have in the face of a steady stream of economic gloom? 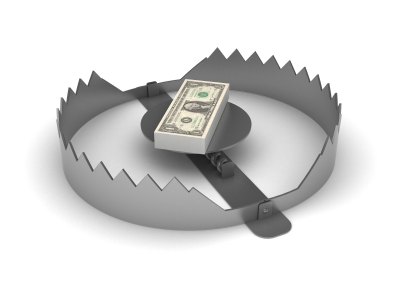 We can start by setting aside money for future expenses as well as keeping in mind a number of spending traps. We dislike being confronted with this reality until the monthly statement arrives in the mail or their inbox. While credit cards serve a useful purpose when used carefully and with responsible planning, we cannot forget how much they can afford to pay back. Easy access to our money with debit cards and ATM machines do not help matters, but we can take a proactive step and setup a text message alert with our bank that notifies us of our account balance before making a purchase. We like the fact that home equity loans are tax-deductible and that we can use the money to pay off a large debt like a credit card. If we do not intend on using that credit card ever again, using a home equity loan would make sense. However, if we fall into the trap of using our newly paid-off credit card and resume our spending habits, we would have the loan AND the credit card to pay off. Did you or your spouse already spend the extra money in your minds? For example, you want to remodel the kitchen, whereas your spouse wants to take the family to Hawaii. Before the money arrives, deduct any taxes from it, then work with the remainder. Does your budget include spending on food, housing, and transportation? Yes, as it should. However, is it complete? No, especially if you excluded occasional expenses such as taxes, gifts, insurance, car repairs and family vacations. How can you include occasional expenses practically in your budget? Estimate how much these expenses will come to on an annual basis, then divide that figure by 12, allowing you to set aside enough money each month. You and your spouse are agreeing not only on the “complete” budget, but also on allowances for each of you to spend money on what is important to you or them. Drawing up a budget that excludes these allowances would cause resentment and cause one to spend the money in other ways. So what does it take to live within your means? Awareness of your financial situation, making sound financial decisions, and discipline to follow through with a carefully made budget come to mind. Understanding that using credit cards produces debt straightaway whereas spending cash is merely a reduction in assets would be a significant step away from falling into a spending trap. You can borrow money against your home to pay off a debt, but make sure you never create that debt again, lest you have two payments, the original debt and the second mortgage, to make every month. Finally, creating a complete budget that includes spending on regular and intermittent expenses, as well as allowances for you and your spouse, will help you both live within your means and be better prepared for life’s spending traps. Disasters can strike at any time, arriving in the form of unannounced earthquakes, forecasted yet still destructive hurricanes and tornadoes, other acts of God and even man-made chemical spills or power plant meltdowns. When disaster strikes, are you prepared? What does being prepared mean? The makers of one such disaster kit breaks it down like this: Food, water, shelter, first aid, alert, and “other items”. The first three should look familiar to you as the traditional items on an immediate “basic needs” list, while first aid deals with injury inflicted during the disaster. Alert items help EMT or search and rescue find you sooner. “Other items”, such as a dust mask and work gloves, help reduce further injury. Why do I recommend buying a ready-made disaster kit? While these kits come with everything you will need, creating a disaster kit from scratch and buying everything that comes with it takes a lot of time and effort. 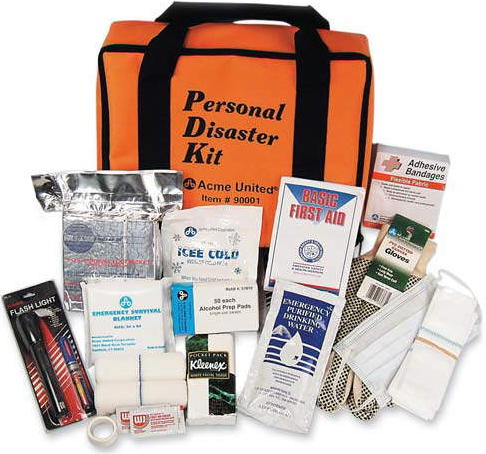 The 58-item disaster kit comes with 21 unique items. Would you like to run around a sporting goods store or department store seeking out these items? Furthermore, you may need to make a trip to a specialty store if you can’t find some of the items. In any event, purchasing a ready-made disaster kit will cost between $40-90. Creating one from scratch will cost around $80 if you purchase the items in bulk, but you will be left with lots of leftovers, enough to make multiple kits. If you feel compelled to create your own disaster kit for, say, your family of four, buying the items in bulk will save you a lot of money. Below, I will also list the number of items purchased in bulk in parentheses. Even if you assemble four complete kits and stuff them in a single orange backpack, you will still find yourself with a lot of leftover items, as the numbers will show. As you can see, just four items (flashlight with batteries, whistle, First Aid guide, and work gloves) were not purchased in bulk. In any case, unless you ran a doctor’s office, were compiling a disaster kit that complied with OSHA, or had accident-prone children, the chances of requiring so many first aid items, hand warmers, and packets of hand sanitizer are slim. You may save a lot of money by assembling your own disaster kit but you will waste a lot of time doing so and you will have a lot of items leftover. It is never too soon to purchase a disaster kit so that you and your family can have some peace of mind when the unexpected takes place. Disaster kits address the most basic of human needs. Do not wait until a disaster already takes place to think about the needs of you or your family. 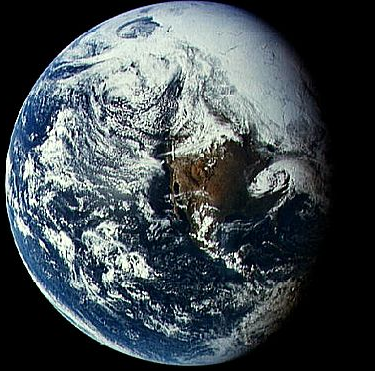 The evening of April 22 marked the launch of the United State Air Force’s spacecraft, the X-37B Orbital Test Vehicle, into space to test “a new batch of reusable technologies”, according to Gary Payton, deputy undersecretary of the Air Force space program. Launched into space using an Atlas V rocket booster from Cape Canaveral in Florida, the test vehicle will undergo a demonstration mission. Payton, however, would not go into further detail about the length of the mission or what exactly the demonstration will entail. Following the mission’s end, the craft will land at Vandenberg Air Force Base in California. Following the renewed commitment of the government to the U.S. space program, we can expect more aerospace-related activity in the near future. What do parents or guardians do to contribute to the headache of applying to financial aid? Among the errors that this blog will discuss, parents do not exercise enough caution when filling out financial aid forms as well as not weigh their college options strategically when their children receive financial aid. What other mistakes do they commit? If you think that applying for financial aid is on a first come, first served basis, think again. The faster (and less careful) you apply for financial aid, the more likely you are to commit errors. Remember: you have a deadline for submitting the financial aid forms, and the Department of Education has a deadline for informing you of your eligibility in the form of a Student Aid Report (SAR). You do not want to submit your forms a second time with corrections and, therefore, waste even more time. You should not base your child’s college choices just on the colleges you can afford, lest your child is fine choosing among state schools or community colleges over their dream college. Furthermore, do not base the financial aid your child may or may not receive based on the aid your child’s friends did NOT receive. Their financial (in)eligibility is not tied to your child’s. On the other hand, assuming that your child is eligible for 100% tuition-covering aid is unrealistic and potentially very tragic for your child. What would you tell your child who applied to expensive colleges, only to find out that they are eligible for much less aid or, worse yet, none at all? In order for your child to have at least one affordable college choice that requires little or no financial aid, your child should apply for a state-supported college in your home state. However, even if their dream college is not financially possible, let them apply to it, anyway, but with the clear understanding of the financial infeasibility of attending it. Strategy: If your child’s high school limits the number of colleges to which your child can apply, have them apply to schools that seek similar grades/GPA and SAT/ACT scores. If your child is accepted to these colleges, you can leverage the school with the most generous financial aid package against the school your child prefers, and they may counter with a more generous aid package still. Given the rising cost of college over the years, the tuition of out-of-state public schools is almost on par with private schools. Never rely on your relatives paying for your tuition. They live their own lives and deal with unexpected expenses that the promised tuition must cover instead. Therefore, even if a relative has agreed to pay for your child’s tuition, apply for financial aid, anyway. In the worst case scenario, financial aid will cover tuition expenses, but in the best case scenario, the windfall can help you pay off your financial aid debt sooner. Do not apply to colleges based on the cost of the school’s tuition alone. Why? Because need for financial aid is based on the difference between the school’s cost and what the family is expected to pay. Conclusion: Financial aid packages may help lessen the overall cost of tuition as long as you can demonstrate financial need. Personal loans through a bank maybe expensive in the long run. Go to the financial aid office of the college your child attends for better, much more attractive financing arrangements. Your child does not have to pay off college loans in the early parts of their careers if you apply for a Perkins Loan or subsidized Stafford Loan. These loans do not charge interest or require repayment of the principal until a few months after the child graduates, leaves school, or drops below half-time status. 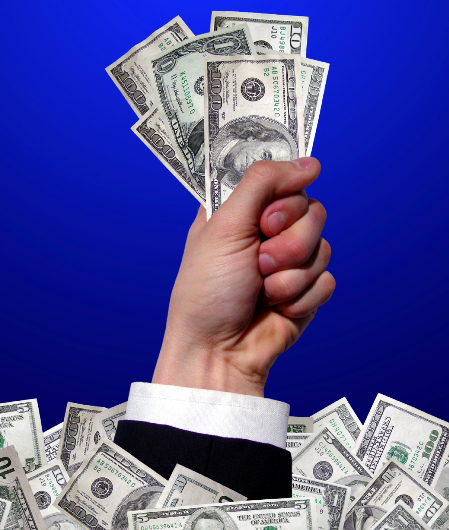 Turn to these loans instead of, for example, a home-equity loan, which charges interest immediately. Do not respond to a college that sends you a financial aid package first. Instead, wait until the financial aid packages from all the schools your child was accepted to have arrived. Your strongest leverage is a competitive package from a similar-caliber school. That aid package could be used as a bargaining chip to get a better deal from your child’s first choice. Your child’s senior year in high school is not the best time to think about making financial aid decisions. Instead, begin planning your child’s financial aid eligibility when they are in 10th or 11th grade, starting with the effect of your income, assets, debts, expenses and retirement provisions. Consult a financial aid/college money guidebook or, better yet, hire an independent aid consultant. Keep in mind: the criteria for how state schools distribute aid is very different from those for private schools. You want to give yourself a head start of a few years so that you can understand financial aid, including how to fill out a FAFSA application. Yes, a few years. During your child’s sophomore and junior years in high school when they are still wondering where they’d like to go to college and what to study, you can do your own homework based on their tentative choices for college. By the time they do apply for college in their senior year, you will have already determined ahead of time how you would finance their college education. By getting a head start on understanding financial aid and avoiding the most common financial aid mistakes parents make, you will help your child get the best financial aid package possible. The winner of the “Tax Day Nintendo Wii Giveaway” contest! Our company conducted a “Tax Day Nintendo Wii Giveaway” contest that ended on Thursday, April 15, 2010, at 11:59PM, California time. I am very pleased to announce that the winner of our contest is Staisha Flescher-White of Maryland! Congratulations, Staisha! The Nintendo Wii is on its way! Thanks to everybody on Facebook and Twitter (and both) who participated in the contest. If there was any hard part to the objective drawing, it was pressing the “Generate” button at RANDOM.ORG 47 times, a prime number I chose by adding 9, 10, 11, 12, and 5 while staring at the clock the night of the contest. Yes, a random number on my part. We will have a new contest in the future with a new prize up for grabs. Again, thanks for your participation! My case study on Twitter Influence takes a different approach. I will discuss two prominent, highly followed, highly listed and highly influential users on Twitter: @TweetSmarter and @tonystevens4. While each of them applies the basic principles of social media and social networking, they have distinct ways of doing so. I will present my findings from what I have learned by following them for quite some time as well as example tweets that justify my findings. I would describe TweetSmarter as a reliable source of information for topics ranging from Twitter, social media, and tech news, among other topics. The manner in which they are a source of information is intriguing, to say the least, but also painstaking and selective, thereby contributing to their trustworthiness. They are also responsive to people who have questions and concerns about Twitter. If they find an article from a website, they produce a shortcut link through j.mp, which is run by bit.ly, and tweet the article to their followers. I would describe Tony as a Twitter Power User. He makes it abundantly clear in his bio his purpose for being on Twitter and the subject matters that his Tweets will likely cover. I find Tony to be a rare gem because of this. Other users may have similar content in their bio, but if you go through their tweets, they probably do not discuss anything close to their own bio. Moreover, the bios of these people may reflect what they do in real life but isn’t a topic they readily discuss. In any event, Tony’s tweets are wide-ranging and reflect his interests: Twitter; social media, tech news, photography, and (properly cited) quotes, among others. Speaking of acknowledgment, Tony also recognizes his followers who retweet his tweets. I have retweeted many of the things he posted not to be on his good graces (although I am) but because his tweets add value to my Twitter and social media experience. Most of the Twitter and social media-related tweets in my bookmarks have come from Tony as well as TweetSmarter. Tony has taken it upon himself to educate his followers about Twitter and, until recent changes to Twitter’s policy that banned recurring tweets, devoted Thursdays to posting “Twitter Tips”, a series of tweets that explain how to conduct yourself on Twitter as well as how to make the most of your Twitter experience. While he can no longer schedule tweets as before, Tony does promise to post his “Twitter Tips” throughout the week. While meeting other people on Twitter and engaging them in conversation, a daily activity for Tony, is the most overt way of making the most of social networking, Tony takes it a step further. He adjusts a retweet so that the multiple users who passed it around are duly and conveniently recognized. After all, one of those users was the first to send out the tweet. At the same time, he recognizes the people who retweet his tweets. Tony serves as a model for successful social networking engagement. What lessons have I learned about creating a strong Twitter Influence by following TweetSmarter and tonystevens4? Tax Day Nintendo Wii Giveaway contest ending soon! With just a few more days before the end of our first contest, co-founders Rick and I created a video to let others know that they still have time to send their entries. Admittedly, I haven’t edited a video in a few years, so please bear with me. Fake accounts have long been a problem even before Twitter existed. Some people create fake accounts out of spite or admiration, while others create fake accounts because they like the attention they wish they were given if they were the person they impersonated. Whatever the reasons, Twitter created the “Verified Account” feature to help users that face impersonation problems. They did not, however, create it to separate the popular from the not-so-popular, or the famous from the not-so-famous. Yes, some celebrities, musicians, and athletes have verified their accounts with Twitter, but Twitter has also rejected the applications of many other high-profile users, as well. What are the characteristics of a “Verified Account”? Let’s look at one. 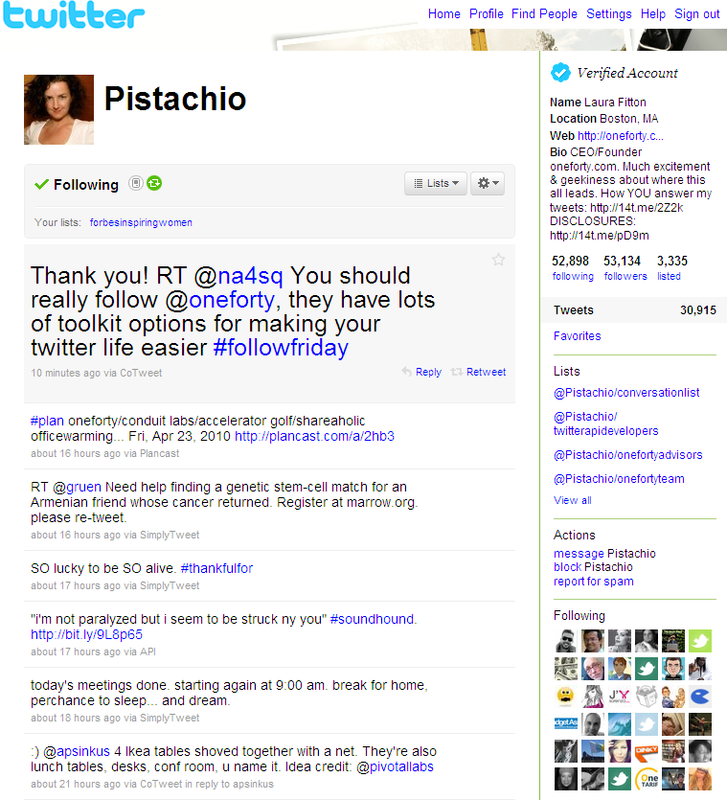 This is the account of Laura Fitton (@Pistachio), CEO/Founder of oneforty, a company that develops and promotes innovative tools that makes Twitter an enjoyable experience. At her bio in the upper right corner, you can see a turquoise, eight-pointed star with rounded corners and a white check mark, made at a right angle, inside the star. To the right of the star are the italicized words, “Verified Account”. The star and italicized words are above her full bio. Finally, you can read her full name in the Page Title (Internet Explorer and Firefox) or browser tab (Firefox, Internet Explorer, and Google Chrome). As an aside, Forbes listed Laura as one of “20 Inspiring Women to Follow on Twitter”, and I highly recommend that you follow her as well as the other women on the list. People who wish to make a fake “Verified Account” designation can get creative. Some people have resorted to taking a screenshot of a verified account and putting it in the background. Their work becomes undone when people view their Twitter account on monitors with different resolutions. For example, the resolution of my computer monitor here at work is an eye-squinting 1680 x 1050. The other co-founder of our company sets his at 640 x 480. Despite having the same 20″ wide-screen monitor, we have vastly different views of the Twitter backgrounds of other users, even our own Twitter account. Unless every user had the exact same screen resolution as the fake verified account maker, this method is doomed from the start. How else do people create fake verified accounts? Let’s look at one. By the way, for the person’s sake, I removed the person’s avatar, username, and most of the bio to protect their identity. Take a look at the “Name” field. The person inserted a black check mark just before “Verified Account” in normal, non-italicized print. The check mark is not at a right-angle, as seen here. Some people have even taken to inserting the false information at the “Location” or “Bio” field. Finally, the very words, “Verified Account”, may appear in the Page Title (Internet Explorer and Firefox) or browser tab (Firefox, Internet Explorer, and Google Chrome) where the person’s full name should have been. Twitter takes the use of fake Verified Account badges very seriously and will permanently suspend the account of anybody found using it. If you have already amassed thousands of followers, creating a fake Verified Account badge is not worth the risk.